The above beauty products are my current favs. I have been using the Chanel Mat Lumiere for about 6 months and am really impressed with it. It ain't cheap, but c'mon we're talking about faces here. Shouldn't we splurge on what people see when they first approach us? (Well, I actually think people look at my mid-section first these days and then my eyes, but I'm okay with that. :) ) The Mat Lumiere is great for us Floridians fighting off humidity and that mid-day shine. Great coverage without being too cakey - g-ross! 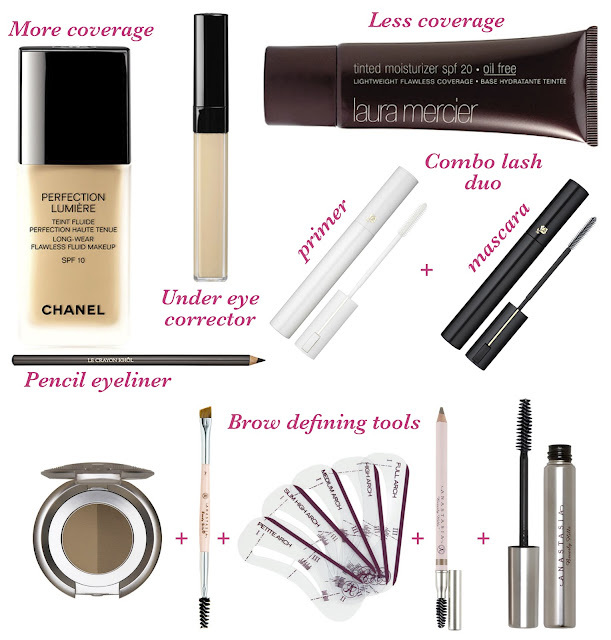 I also like the Chanel Correcteur for under my eyes and to cover any blemishes. It's creamy and smooth. For my weekend foundation when I'm running errands around town or sitting pool/beach side I always wear Laura Mercier's Oil-Free Tinted Moisturizer. I've been using this one for years; it's great. Lightweight, adequate coverage and for having SPF 20 (a must in this sunny state) it doesn't smell like sunscreen, which I love. I was pretty skeptical of vibrating mascaras when they first hit the market. I mean was it really necessary to actually have a pointy wand vibrating that close to my eyes? Even more I was thinking, 'Is primer really necessary??' I mean I'm used to primer being using prior to painting dressers and walls, but for my small quarter length lashes? However, then the Nordstrom make-up artist tried the 'Oscillation Powerbooster' Vibrating Amplifying Primer followed by the 'Oscillation' Vibrating Infinite Powermascara on me and wah-lah! I was hooked!! It made my eyelashes look, well, fake almost. I've always had thick, curly lashes anyway, but this mascara duo took them to another level. I'm telling you, chicas, try it. I'm also a fan of Lancome 'Le Crayon Khol' Eyeliner. I used nearly every workday. I don't get too fancy-shmancy with my eyes during the week and this basic pencil eyeliner does the trick. I recently had my brows shaped at Nordstrom at the Anastasia Beverly Hills counter. I will be going back there for sure. Not only is Nordstrom 5 minutes from my office so a great lunch break for me, but I was really impressed with the shaping the make-up artist did. I bought the Five Item Brow Kit and use it nearly daily if I haven't woken up late. With thicker brows being in trend right now this is a great tool set to get the perfectly shaped brow. That's it for now, my ladies! Hopefully this helped if you're looking for any new products to try out. I will update later with any other items I try and truly like the results. I'm still looking for a great eyelid primer, face primer and liquid eyeliner. If you have one you love, let me know! I may need to try that eyebrow shaping kit! i am terrible with doing my own brows. i wonder if you can teach me?